Here we see how the British Queen concentrates on her horse and is unaware of public attention. She is only aware of the presence of her horse. It is also clear the horse gives all its attention to her. The occasion was, however, not at all private. Estimate had just won the Ascot Gold Cup, a race with a history of 207 years, and this day on Ascot happened to be a special Ladies Day. 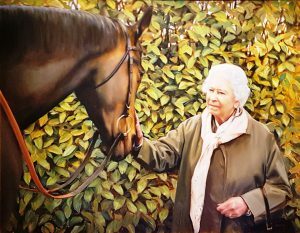 The Queen is known to have a very personal involvement in her race horses and the artist has succeeded to transfer this close relationship. At the time of this race, 2013, the Queen was 87 of age, and here she shows how little her age influences her style. Even when the artist gave more attention to the Queen than to this English thoroughbred horse, he masterly rendered the relaxation of Estimate under the attention of Elizabeth: a wonderful double portrait. How many eyes has a horse?